As soon as a few seconds after your successfully funded Kickstarter project ends, you will be able to compose and send a survey to your backers. Today I’m going to talk about when you should send out that survey (hint: Wait more than a few seconds after your project ends), what questions you should ask, the nuances of creating the survey, and a few alternatives to using Kickstarter’s system. When Should You Send Out the Survey? If you’ve been researching Kickstarter lessons on other websites, you’ve probably seen the following advice: “Wait as long as possible before sending out the backer survey.” I’m not going to say that advice is wrong, but…well, it’s not correct. For most projects, at least. The reason you’ve seen that advice is primarily for one big reason: Backer addresses will change, and it’s a little bit of a hassle to change them manually later. Plus, some backers will forget to update their address even if you remind them. That’s a legitimate reason for stalling on the survey, but I think the following reasons for sending it out soon after the project ends are more compelling. Delays in Responses: You might be surprised at how many backers don’t respond to the survey right away…or at all. I sent out the backer survey for Euphoria over a month ago, and despite several reminders, 44 people still have yet to respond. That may not seem like a big deal, but you’ll see the reason on the next point. My point here is that if you wait too long to send out the backer survey, it’s going to be months before you actually hear back from some of your backers, which will make your shipping process all the more difficult. Unknown Shipping Destinations: If you’re using the old method of shipping all products to your apartment and handpacking them individually for backers around the world, not knowing your backer locations in advance isn’t a big deal (even then it’s helpful so you can estimate costs in advance, though). But if you use the Stonemaier Method (I should totally trademark that) of sending pallets and bulk orders of games directly to Canada, the EU, and the US, you absolutely need to know where you backers are well in advance. This is imperative. If you combine this with the first point, it means that you really need to get the survey out within a few weeks of ending your project. Perception of Laziness: If you wait months and months to send out your survey, your backers are going to start to think you don’t have your act together. Updates help, but they don’t always feel like forward progress. The backer survey does. I’ve heard many backers complain about how some projects don’t have their acts together, and the lack of a survey is one of the reasons they cite. Now, keep in mind that you only get to send out your survey through Kickstarter once. One shot. So you don’t want to rush the survey. Make sure you know all questions that you need answered from all backers (you can always survey subgroups later through alternative methods). What Questions Should You Ask? Kickstarter’s guidelines are somewhat clear about the types of questions you’re allowed to ask: They say that you should only ask questions that you absolutely need to know, and you can’t ask marketing or demographic questions. I can’t find anywhere that they elaborate on exactly what that means, but I think they’re saying that you can’t survey backers about how they heard about your project or about their race, gender, religion, etc. The tricky thing that you may not realize when making your project is that you have to survey each reward tier separately. You actually have input the questions individually for each tier’s survey. This is nice because you can ask different questions for different groups–you don’t need backers to answer questions that don’t apply to them. However, it takes a lot of time if you have a number of reward levels. If you like to keep all of your backers on one master spreadsheet after the project, having different types of questions can make that spreadsheet difficult to build and maintain. So keep that in mind as you’re structuring your questions (and your reward levels). Surveys aren’t just for getting the information you need to make and ship the product. Surveying for demographic info isn’t allowed by Kickstarter. Here are the questions I asked on Euphoria, exactly as phrased on the survey and followed in bold by my notes. You can now choose to make some questions optional and others mandatory. Preliminary Message: Thanks for helping us create this game! You will have the chance to update your address before we ship, but we need your information to know how many games to send to each of our fulfillment centers. ————International Backers: Please use the English version of your address, and capitalize letters in your full postal code. GREAT BRITAIN backers: Please enter your region in addition to your city. If you would like to be added to the Stonemaier Games monthly e-newsletter, what is your e-mail address? If you are to receive a toast on camera ($1 pledge or $1 add-on), to which city would you like us to toast and why? Are there are any important details we need to know about your pledge? For backers in South America, please provide your CPF. Pro Tip: Pick the core reward level with the fewest backers and send their survey first, then wait a few minutes to get some completed surveys. Then look over a completed survey to see if it makes sense from your perspective. That also gives those backers a few minutes to post questions in the comments, just in case something is confusing to them. If you need to change something in the format, you can do so before sending out the survey to other reward tiers. Google Forms: I used Google Forms on Viticulture, and I liked how easy it was to create and share. However, it has several flaws. First, it’s really hard to figure out which backers haven’t replied to the survey. Almost impossibly hard. For that reason alone, I wouldn’t use this method. But if you need another reason, it would be that backers will forget that they filled out the Google Form, and they’ll accuse you of never sending out the survey. That’s not fun for anyone. Still here? You need a third reason? Fine. You can’t use the resulting Google Spreadsheet for Amazon Fulfillment, so after you download the initial influx of responses, you’ll have to input the remaining responses one by one on your master spreadsheet in Excel. Excel SkyDrive: This method still has the first and second issues mentioned under Google Forms, but it solves the third issue by syncing your offline Excel spreadsheet with the online one. BackerKit: I have not used BackerKit, but I’ve heard good things. It’s a platform that syncs with Kickstarter’s survey app and lets backer update their addresses and upgrade their pledges (if you allow that) through the BackerKit app. Honestly, it sounds pretty awesome, but I wasn’t willing to give up 1% of my Euphoria Kickstarter funds to use it. $3,000 is a lot of money. That’s it! I look forward to hearing your thoughts on important questions to ask in surveys, annoyances that you see in some surveys, and what you think about my stance on survey timing. Also, if you have any alternative ideas, let us know! UPDATE 1: The guys over at Hibermate, a very successful Kickstarter campaign, have created a video that shows you how to combine all the downloaded backer reports into one Excel file. Check it out here if you’re a Mac user. Thanks for helping us create Scythe! There’s lots of variability and customization within each pledge, hence the detailed survey below. For shipping, please use a secure, reliable address. You will have the chance to update your address before we ship. All pledges are closed and final; all pre-orders and add-ons from now on are made here: (Bitly link to Celery pre-order page) (use PROMOCODE to get free shipping when combining new stuff with your original pledge). If you paid $1 for the backer toast, to whom/what (suggested: pet/favorite animal) would you like us to toast? Are there are any important details we need to know about your pledge? For backers in South America, please provide your tax ID number/CPF. *This is another reason why add-ons make a project more difficult than it should be. You may only have a tiny percentage of backers that added your t-shirt to their survey, but you have to ask every single backer what t-shirt size they want because those backers are scattered across all reward levels. I’ve participated in a couple of projects that used BackerKit, and it seemed very professional and mostly intuitive. Particularly good for scenarios that involve lots of add-ons, I think. Thanks so much for this information. The notes about address formats alone will save us a huge amount of headaches! Jamey – Thank you so much for this informative post. I can really see the value in getting information from your backer survey as soon as possible (we will be using the Stonemaier shipping method!). We are going to have 4-6 months in between the end of our campaign and final delivery to our backers, which is quite a bit of time for backers to changes addresses. If the backer survey can only be sent out once, how do we go about updating the list later? I chose the option to allow address changes, but since there’s a big time gap between now and shipping, I’m guessing a lot of backers will forget to update addresses. I added a multiple choice option on my survey that said something like “this address is permanent” or “I may move, please remind me to verify my address.” In the last few weeks, I’ll send an extra reminder email to everyone who chose the “I may move” option. It’s no guarantee, but I think it might help. Wendy: That’s a clever question to add to the survey! I like it. Jamey: Thank you so much for the advice which we will use! Wendy: Thanks so much for the idea! Jamey: Is there a way for your Kickstarter backers to get more games after the campaign is over? I have had several people pledge just one game during the campaign but now they are seeking more than 1 copy after the campaign is over. I just saw your update that you will be at GenCon. We will stop by your room and say hello! For Tuscany, I gave backers an additional 3 weeks to add onto their pledge, and I also let non-backers get the Kickstarter versions of the game for a premium price during that time. Jamey: I have a follow up question from my earlier post. I set up Shoplocket (thank you!) and I am receiving orders! To clarify my previous question, is there a way for my backers to add additional copies of my game (that they had not previously backed) using the backer survey? For example: a backer pledged for 1 copy of the game and now wants another copy? Loren: There’s no way to do that using the backer survey, but you could let backers do that over ShopLocket. You would need to set up a separate ShopLocket widget with backer-specific pricing (if you want to continue to offer backers the KS price) and host it on a page on your website that only backers know about. Jamey: Thank you so much! I wanted to make sure that I knew the answer as my backers are likely to ask. Shoplocket is fantastic. I am a fan! Jamey: I am in the process of sending out my backer surveys. Is there a way to re-use a backer survey for multiple tiers without the need to re-type the survey over and over again? Sorry Loren, you have to retype the questions each time. That’s why I avoid multi-choice questions. I prefer to type out the questions on a Word doc and copy and paste them over (I normally don’t encourage cutting and pasting, but so many of the questions are the same, and it makes it easier to compile all of the separate spreadsheets onto a master spreadsheet if the questions are the same). Also, why do you recommend work addresses for delivery over home addresses? Work addresses tend to be more consistent and reliable. Quite a few games get stolen from front porches, and those costs (sending out more games) are passed on to you. It’s more of a win-win for backers and creators if packages are sent to addresses where someone is there to receive it during the day. Thank you so much as usual! I should just hand write you a thank you note about once a week and put it in the mail! On a side note, I can’t get the paste function to work for all the additional questions after the intro section. I have a lot of backer tiers so it is quite the pain staking task! That’s very odd. I didn’t have that issue a month ago on the Treasure Chest survey. Figured out a fix. If I type a single letter into the questions then I can paste text from another source. Its the weird little things . . .
Any tips for survey stragglers? We had about a 97% response rate almost immediately, but we’ve still got a handful of folks who are unresponsive. I’ve emailed each of them directly several times as well as messaging them through Kickstarter. Since some of them are to be acknowledged in our book and we need to go to print soon, I’m eager to get in touch. By the way, on our survey, we had multiple choices in which backers could add extra standard books to their existing reward level. So, for instance: a) just send one bronze level book b) send bronze plus one standard book c) send bronze plus two standard books d) contact me for additions. (We indicated that we’d invoice them for any difference via Paypal.) We picked up a lot of book additions during the survey period. Finally, I have noticed, based on comments left on other campaign pages, that some backers have an aversion to Backerkit. I’m not sure why, but seeing that has made me glad that we did things directly. It’s more work, but I feel I have more control. Also, I made sure to review each survey individually and write to each backer individually to let them know that I did. Backers really appreciated this. Wendy: I wish I knew how to get stragglers to respond! :) Like you, I’ve followed up with stragglers from Tuscany multiple times in multiple formats, and some of them simply don’t reply. If they don’t give me their address, I can’t send them the game, so that’s on them. I like that you essentially created your own BackerKit. It probably took more work for you, but that personal outreach goes a long way. Hey Jamey, I’ve been modeling my campaign after your lessons. Thanks for putting all of this information online for everyone, you’ve been a big help to all of us. That said, I’ve got a question about this post: why do you ask for the tax ID/CPF numbers for Asian/South American backers? Maybe I’m a little confused by this, but wouldn’t that be similar to asking someone what their social security number is? Josh: That’s a good question, and I wish I knew the answer. The company I ship with in China uses FedEx to ship internationally, and they claim that FedEx requires those numbers to ship. I don’t know why it’s needed for Asia, though the best explanation I’ve gotten for Brazil is that things shipped to Brazil often get caught up in Brazilian bureaucracy, and the numbers can help backers search for and claim their shipments at the local customs office. Ah gotcha. Thanks for the heads up! I have a project that is about to end soon (5 days) with over 1450 backers (https://www.kickstarter.com/projects/1473560159/gg-an-addictive-strategy-card-battle-game) and now I’ve started to think about the survey and wrong pledge amounts. I’ve seen a lot of backers pledge wrong amounts (I’ve lot’s of backers with addons with different prices), most of them forgot to add the shipping cost. I’ve messaged every wrong pledge when I saw it but I’m sure I’ve missed a lot and some of them didn’t change the pledge amounts. So my question is, after sending out the survey and asking what they pledged for, some will answer “2 sets and the wooden box” but the amount they pledged will be lower than what they should have pledged. What should I do in this situation? I’ll have paypal in place and thinking of sending a message right away but if I don’t recieve an answer, should I ship the game or what? I really would love to know what you think. Alican: Thanks for your comment, and congrats on the success of your project! In general (just for future reference), I would recommend manually creating the shipping cost for each country/region at each reward level. That way it’s foolproof, as it’s automatically added to a backer’s pledge instead of them having to manually update it. In your case, I would recommend three things: One, create a very clear, visual project update with instructions on how to calculate total pledge cost (add ons plus shipping) and how a backer can update their pledge amount. Two, send out a mass message through Kickstarter to each backer tier (or all backers at once) that has those instructions and a link to the update (as it’ll have visuals you can’t include in the message). The point of those first two steps is to try to fix as many of the issues before the project ends, because after that it becomes a lot harder. After the project, this is a case where you might want to consider using a service like BackerKit or Pledge Manager. They’re specifically set up to address issues like these. If you decide not to use them, you’ll need to review each pledge one by one and contact backers with incorrect pledge levels with a PayPal request. Actually shipping is $8 worldwide for my rewards but the problem is, after they add addons which they do manually, they usually forget to add the shipping cost to their pledge amount. I’ll be using Pledgemanager but as far as I know, even with them, I’ll have to manually check with every single backer if they forgot anything. I guess I’ll wait till the end of the project and try to solve the issue using PledgeManager. Making an update on this issue would probably cause a lot of cancellations. I guess there are currently around 30-50 backers with this problem and this would be easier to solve using the pledgemanager. What is your opinion? Alican: You really think it would cause cancellations? It’s not like you’re surprising backers with new fees–it’s all there on the project page. I think backers would much prefer to have clarification about it now than be told after the project that they need to pay more. I think then you would have some angry backers and some cancellations, but not during the project. Trust your backers to make the right choice and give them full, transparent information during the project. Let’s test and see :) I’ll post an update today and include this information and see how it goes. I’ll share it with you afterwards. 3 cancellations and around 40 addons :) Thank you for the great advice once again. I saw on your Kickstarter project page that you were helped by Funded Today. How was your experience with them? Would you recommend them? What services do they provide? Well done taking the plunge! I think you’ve also earned intangible points with your backers for clear communication as well. First, just want to thank you for this entire series—it’s been incredibly useful. I’m sure it’s widely acknowledged, but I think it’s an invaluable resource for the entire community. I was wondering what your thoughts are on using a Typeform survey? I want to make the survey process as frictionless as possible. Typeform lets you use logic jumps, so backers would only see questions relevant to them, and we’d be able to offer them multiple text fields, etc. in the survey when necessary, depending on their answers. I’m just concerned about response rates. 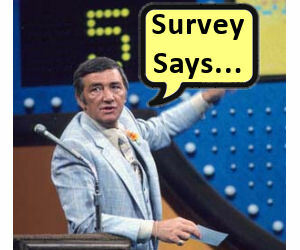 Would it be acceptable to link to the appropriate survey in the Kickstarter backer survey, thereby forcing their hands? Wesley: Typeform seems like a great solution! Though it might make some backers uncomfortable to be redirected to a different site when they’re filling out the survey. Having their responses on Kickstarter also makes it easier for them to check back later to see what they typed. Thank you Jamey. Very helpful. or any other questions surrounding it? Randall: Sure, it’s okay to ask that type of question. I was wondering, if you have made any updates to your Scythe survey and if this one is up to date? Viktor: Thanks for your question. It was a good opportunity for me to list a condensed version of the Scythe survey at the bottom of this post–you’ll see some subtle changes there as compared to the Euphoria version. Jamey, thanks for this. I just finished my project (Pariah Missouri) and it’s a set of comics and RPG, its not due until Jan, so I have months to finish it, but I really want to be strategic in my sending out Surveys, I’ll be using BackerKit, I have used it 4 times and love it, but I’m working with much smaller units than you. Here’s the thing, I want to be strategic and maximize add-ons (many of my backers are $1 pledges) so for me it’s one more shot at getting them to the higher tiers. Would you say wait until things die down and in a few months and come back at them once we are close to delivering and share that excitement, OR hit them up now when we are just finishing and the excitement of the campaign? I’m concerned about backer fatigue and that extra sales type of message to them. Andres: Thanks for sharing your experience with Backerkit–I’m glad to hear it. That’s a really good question. Let’s look at it through a different lens: What’s best for your backers? Do you think they would benefit the most if their only opportunity to get in on the higher tiers was now, or closer to when you’re ready to ship? My hunch is the latter, paired with solid communication through project updates over the next few months. That way when you give backers that opportunity, they have a lot more information regarding that decision, and they won’t have to tie up funds for months. There are, of course, reasons that you as the creator might need that information sooner–if that’s the case, you can just send out the Backerkit opportunity then. This may be a stupid question :), but what was the reason for asking your backers the number of copies they pledged to receive? I’m assuming that might’ve been because your rewards weren’t based on being strictly correlated with a certain number of copies? Mine are associated with specific numbers of games and don’t really vary, so I’m assuming I don’t need to ask that. Also, anything else to know that is country specific to ask about (in addition to asking for the region from GB, the tax ID number/CPF for South America, etc.)? I’m working through a fulfillment center and they haven’t mentioned anything like this to be wary of for international shipping, so any tips would be greatly appreciated. Dan: It’s because backers could pledge for more than 1 copy of the game within the same reward level. The pledge totals get obfuscated when you have that plus add ons. That’s it for country-specific stuff that I’m aware of! To your knowledge, is there any solution for PC users? :) I’m trying to gather the data (I’m not using a pledge manager), all I want is to get the country list breakdown in order to have a precise idea of what the shipping will be… If I can avoid doing that manually… Thanks!